Bausch and Lomb has been producing quality optical products for over 150 years. They are well known for their contact lenses, contact lens cleaning solutions, and eye drops, as well as ocular vitamins and pharmaceuticals. 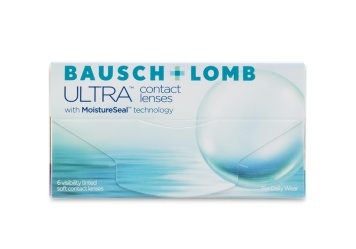 Ultra - Bausch and Lomb's newest contact lens is the monthly replacement lens Ultra. It is a silicone hydrogel lens with "moisture seal" technology. This means that the contact lens maintains its moisture with little loss for up to 16 hours. This lens is made for people who are frequently using digital devices for long hours, and experience end of day discomfort with their current contact lenses. Ultra is now available in lenses for presbyopia and astigmatism, as well as the usual sphere. Here we will provide an overview of the contact lens brands that Bausch and Lomb carry and are available in Canada. Biotrue - "One day lenses inspired by the biology of your eyes". 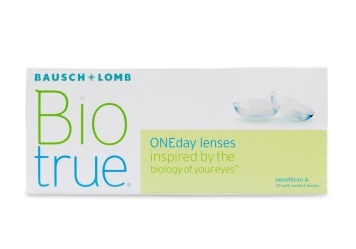 This is the newest daily disposable contact lens from Bausch & Lomb. It has a UV filter, and is made of 78% water for good breathability. Many people find this lens more comfortable than the Softlens daily. Biotrue One Day for Presbyopia - Biotrue one day lenses are now available in a multifocal for those who wear bifocals. Optima 38 SP - A daily wear lens that is packaged in a blister pack, and boxed with two lenses per box. Lenses are recommended to last 3 to 6 months per pair, although some people wear them as a yearly lens. Since most people need different strengths in each eye, the idea is that two boxes will give you a pair plus a "spare pair" (SP). Optima Toric - A daily wear lens for people with astigmatism in their prescription. Packaged in a vial, one lens per vial. Recommended to be replaced yearly. PureVision - A monthly replacement lens made from silicone hydrogel. Breathes better and more moist than a standard yearly lens. Approved for overnight wear. Available in two base curves. PureVision Multifocal - A monthly replacement lens, silicone hydrogel, that is designed for distance and near vision, for those who need a bifocal. Very breathable, moist, and approved for overnight wear. PureVision Toric - A monthly replacement lens, silicone hydrogel, for those with astigmatism in their prescription. Again, breathable, moist, and approved for overnight wear. PureVision2 HD - A new and improved PureVision lens with better optics. Only available in one base curve at this time. PureVision2 HD for Astigmatism - New and improved from the original PureVision Toric. Base curve is slightly flatter. PureVision2 HD for Presbyopia - The new and improved PureVision2 lens is now available for those who are presbyopic, or who need bifocals. Soflens 38 - A monthly replacement disposable lens. Made from 38% water. Soflens 59 - A two week replacement disposable lens. Made from 59% water. Soflens Daily Disposable - A truly disposable lens made for one day use only. Great for travelling and those with allergies. Soflens Daily Disposable for Astigmatism - Same as above but for those with astigmatism in their prescription. Soflens Multifocal - a monthly replacement lens made from conventional materials, for those who need a bifocal. Soflens Toric - a monthly replacement lens made from conventional materials, for those with astigmatism in their prescription.